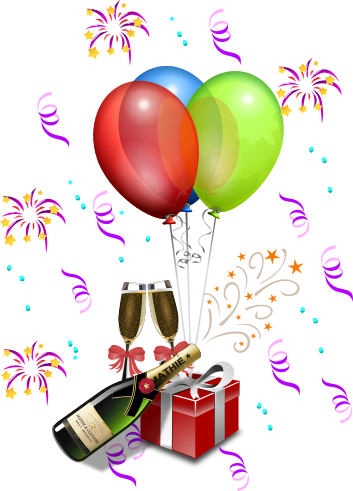 May the new year bring you health, happiness, and success in all your endeavors. "The Clockwork God is a fast-paced adventure loaded with intriguing and unusual characters. The Tinkerer's Daughter series set the stage for this series by introducing the Kingdom of Astatia and the secret of its genetically altered citizens. 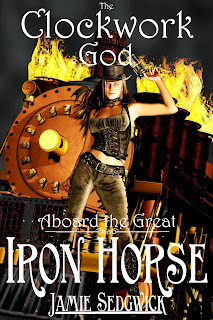 Aboard the Great Iron Horse takes that theme and runs with it. Be prepared for many adventures, and many more surprises as Sedgwick reveals more of this mysterious steam-powered post-apocalyptic world." It's here already! The Clockwork God is Book One of my new steampunk adventure series Aboard the Great Iron Horse. You'll recognize a few of the characters from The Tinkerer's Daughter series and you'll meet some new ones. Pick up your copy from Amazon today! Socrates the steampunk ape is back in an all-new series! The Iron Horse is a massive steam-powered locomotive full of ancient and surprising technological wonders. With his crew of warriors, miscreants, and genetic anomalies, Socrates' mission is to scour the world in search of Starfall, the mysterious element that powers the great city of Sanctuary and most of the world's steam technology. Supplies of Starfall are running low and unless they can locate another source, all civilization may soon collapse. Starfall also happens to be Socrates' power source and without it, he will die. On their first adventure, the crew encounters a bizarre cult of isolationists and their strange "Clockwork God." Meanwhile, several of the crewmembers have gone missing and tensions are rising as mutineers conspire to overthrow Socrates and destroy the train. As the conflict comes to a boil, a power more ancient and sinister than anything they have ever imagined threatens to destroy them all. I will contact you when your copy goes out. The final launch publication is scheduled for the week of December 21, 2013. I will make announcements here, with links as the e-book and paper editions go live. If you do accept an ARC, please take a moment to visit Amazon.com and Goodreads to post a review. All it takes is a few truthful sentences to let other prospective buyers know how you feel, which in turn helps me continue to make a living. *It's important to remember that an ARC is a proof copy of an unpublished novel. They may contain minor grammatical and typographical errors, but theoretically nothing so major as to disrupt the reader's enjoyment of the story. We have a tradition here in the states called "Black Friday." It takes place ever year on the day after Thanksgiving, and it is so designated because it is on this day that many retailers go "into the black" profit-wise. American retailers try to drum up extra business by throwing huge sales often marked by loss leaders like $100 laptop computers or popular electronics discounted by as much as 70%. This is all well and good. It's a sign of a thriving capitalist society and a consumer oriented culture. I get it. Unfortunately, something about Black Friday has changed in the last few years. Big corporations like JCPenney, Best Buy, and Macy's have decided that their massive sales on Black Friday are inadequate. In the effort to wring more blood from the proverbial stone, they have begun to open their stores on Thanksgiving day. This forces shoppers who would otherwise be at home celebrating the holiday with their families to instead rush to these stores in search of bargains they could not otherwise afford. "...a Las Vegas shopper was shot at around 9:45 p.m. local time (12:45 a.m. ET) late Thursday as he tried to take his purchase home..."
"...three people got into a fight in the parking lot of a Wal-Mart in Rialto, Calif., because shoppers were cutting in line..."
"...Another shopper was charged with aggravated assault on a police officer after getting into an argument with a New Jersey Wal-Mart store manager about a television set..."
"...A cop at a Kohl’s store outside of Chicago shot a would-be shoplifter who fled in his car — and dragged another officer who was halfway into the vehicle across the parking lot..."
"...A Thursday night fight over a Wal-Mart parking space in Claypool Hill, Va., ended when one man knifed another in the arm so viciously that he hit bone..."
"...Shopping also ended early for Richard Ramos, 23, of Passaic, N.J., who was pepper sprayed and arrested by police on Thursday night at a Wal-Mart..."
These are just a few stories. You can quickly find many, many more if you do a quick search. There were shootings, stabbings, and fistfights. There were shoppers tasering each other. There were stores vandalized and looted, and even police were injured. This ain't Baghdad, folks. It's not Ethiopia, either. This is America, where 91% of the population has a cell phone and 98% have access to broadband internet. We have no shortage of gadgets, televisions (the average American home has more televisions than people) or other junk. We're not starving, that's for sure. We're on top of the food chain, economically speaking. So why the need for this madness? Is a half-priced iPad really worth killing someone? Is a $100 laptop worth dying over? Violence has long been a side-effect of Black Friday, but it seems worse lately. For the sake of argument, I'm willing to say I'm okay with Black Friday for what it is. The commercialism can't be avoided. It has always been there, and always will be. I also understand the excitement, the rush of adrenaline, the quest for that fantastic deal you'd never get without it. But do we really need to bring this into Thanksgiving? Does Black Friday have to become Black Thursday, marring our holiday with violence and greed, forcing tens of thousands of low-income workers to face this onslaught when they should be at home with their families? I wonder how many single moms left their kids at home alone on Thanksgiving because they had to work? I wonder how many Thanksgiving Day shoppers have considered this, or taken a moment to examine the fact that these fantastic sales prices are costing them something much more valuable in the long run? I, for one, will never take part in this. I will do without that iPad, laptop, or big screen TV, so that somewhere, maybe, a single mom can stay home with her kids on Thanksgiving Day instead of racing out into the snow and leaving her kids home alone. It's also worth pointing out that if we all stayed home, the crap would still be there on Friday.